The phrase “a tired dog is a happy dog” has been debated by trainers over and over again. I’m a big believer in getting the right amount of exercise every day for you and your dog. Everything in moderation, right? But as you know, life gets in the way and things can get out of balance. Mick playing a game. I put the treats in the toy and he has to figure out how to get them out. I ran my own experiment recently with my 2 dogs. Normally we get out for a 1-2 hour hike, off leash every day. I am fortunate enough to live in a place where we can do that. Because I have been boarding dogs in my house for years, the hike is very important to quiet nights. There have been stretches of time, like 4 months that I have not missed a hike. Yes, my dogs live a charmed life. Recently, life has thrown me a few curve balls and this week we missed 3 days! No hikes for 3 days in a row. I did take the dogs downtown one day and on some other errands and outings, but no good walk. Sure enough, the behavioral issues started appearing. Mick, the Jack Russell was whiney and nervous. Every time I got ready to leave the house he was a basket case (he has suffered separation distress in the past). When I did take him in the car he was nervous and unsettled. 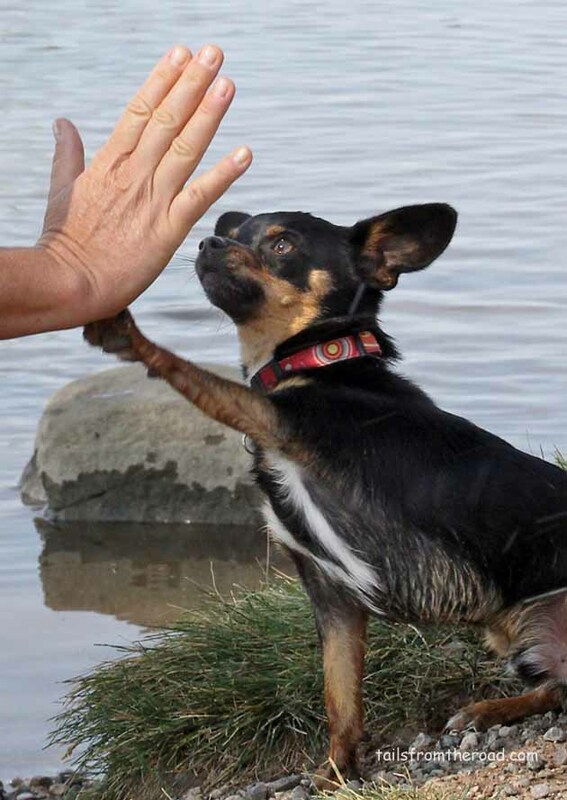 Romeo doing his “high five”. Photo credit: Nancy Richmond Photography. Today we had a wonderful hike in the snow and both dogs are settled and content. Because I study dog behavior, I know the value of exercise, but can you get too much? Yes! I saw my dogs over stimulated over the holidays with extra people in the house and extra dogs in the house. Dogs that are over tired or over stimulated react differently, but usually there is a difference in their behavior. Either cranky, too excited, or just too hyped up. So yes, there can be too much exercise and too much stimulation. So know this and give your dog some down time if you have had a busy stretch of visitors of a different routine. 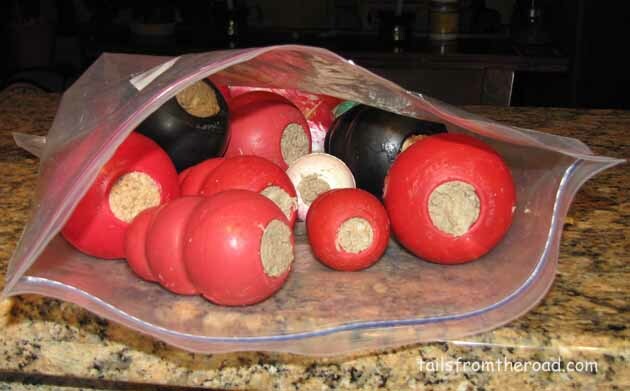 Kongs stuffed with can food and frozen. These make great “busy work”. I do find the daily walk to be the best exercise for dogs. 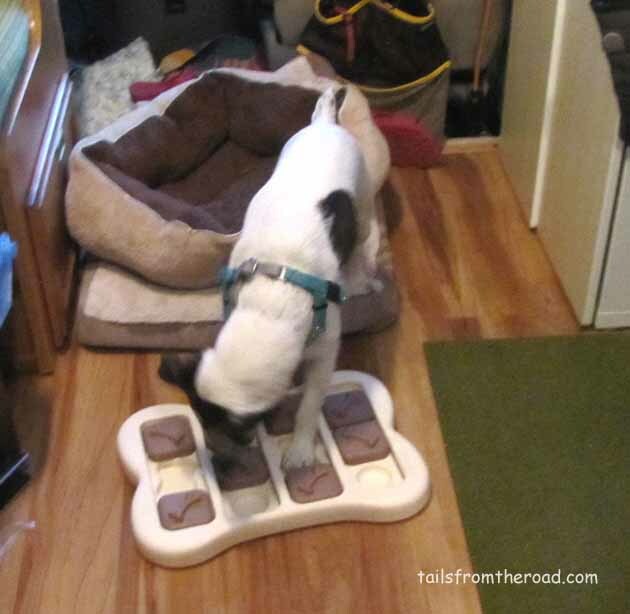 Then you can add in training, play and games as needed to round out the day for your dog. Ideas for you if you can’t get in the walk. Hide treats around the house or RV when you leave. So the dog has to go on a scavenger hunt. This also makes your leaving fun instead of sad or anxiety inducing. Have them work for their food by stuffing a food toy or empty marrow bone with their food (freeze it prior). There are many toys that dispense food, use one of these to feed your dog instead of putting food in the bowl. Hide and seek is one of my dog’s favorite games. Have the dog(s) wait in a room and you go hide. If your dogs don’t have a good stay, have a helper hold them. Put some Buddy Biscuits in your pocket. Hide in places like behind doorways, on the floor behind a bed, anywhere that you are not usually. Call your dog “Fido, Come”. This lets you work on your recall also. Have a party when your dog finds you. I guarantee, you both will have a great time! Teach your dog a new trick. Dogs love learning new things to do with you. Maybe you want to add a rollover? A shake? Or run through the behaviors that they do know in different rooms. “Sit, Down, Shake, twirl, rollover”. Put them in different order, this helps them understand each position. A walk in the dark is good also. If it’s not too cold out, most dogs will enjoy a leash walk anytime of the day. So if that’s your only option, then bundle up and go. 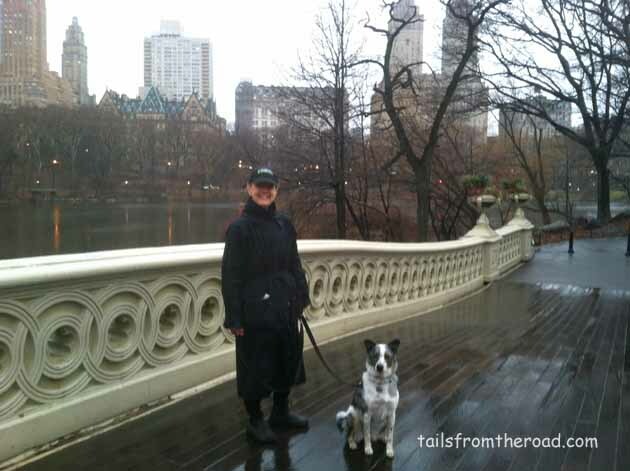 I visited a good friend in New York City and each day they go to Central Park. One morning it was pouring rain and cold, I thought the outing would be cancelled, but no, I was handed a trench coat and off we went. We had a blast walking in the rain. Don’t let the weather stop you; most dogs are game for anything if it’s with you. Katherine & Sophie walking in Central Park. This article was written when I lived in Durango, Colorado in early 2014. Thanks for the visit Betty, love your blog too, great stuff in Arizona! Hi. Love your blog! !🐶 and your dogs and your travels! Just wondering if you have ever gone down into Baja California -and with your dogs? I would like to go but not sure if safe. Any advice?